Senior Luis Hernandez rips a hit in the varsity baseball championship on May 6. The Cards won 9–1. 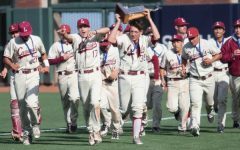 The Lowell varsity baseball team successfully defended their title of city champions on May 6 at AT&T Park, beating their rival, the Washington Eagles 9–1. The Cardinals took control early on by scoring 7 runs in the second inning. The Cardinals took control early on by scoring 7 runs in the second inning, and never looked back as senior pitchers Josh Ng and Craig Colen combined to allow only one run over 8 innings pitched. Lowell also got strong offensive contributions from senior outfielders Markus Min (2–3, 2 runs batted in) and Cookie Imperial (2–2, 2 run double). The victory marks the Cardinals’ third consecutive city championship and the final title for longtime coach John Donohue. Lowell will move on to play in the TransBay series, where they swept Oakland Tech in two games last year. The series will start on May 13 at San Francisco State University and continue on May 15 at Henderson Field in Oakland. If each team wins one game, the series will conclude on May 19 at San Francisco State.